“There is almost no place left in the world where we can’t work,” says Sara Maria Hasbun, who lives as a digital nomad for one-third of the year. In this picture, she is working at the coworking space Hubud, in the town of Ubud in Bali, Indonesia. 31-year-old Sara Maria Hasbun is concentrated on her smartphone, while she counts the countries she has worked from in the past year. She founded and runs the international translation office Meridian Linguistics. “Taiwan – that was fantastic! Chiang Mai in Thailand – that was awesome! Indonesia, Jeju Island [in South Korea], Malaysia, Singapore, then back to Korea and then the USA. Then there were the Olympic Games in Korea. I was in Vietnam for New Year’s. After that I took another trip to the USA. And around this time last year I was in Japan,” she says. That makes nine countries in total. “And just before that I was in a few other countries: Hong Kong, China and Mongolia,” she adds. As she travels she works more than full-time, with her Macbook Pro as her base. She documents a lot of it on her Instagram profile. 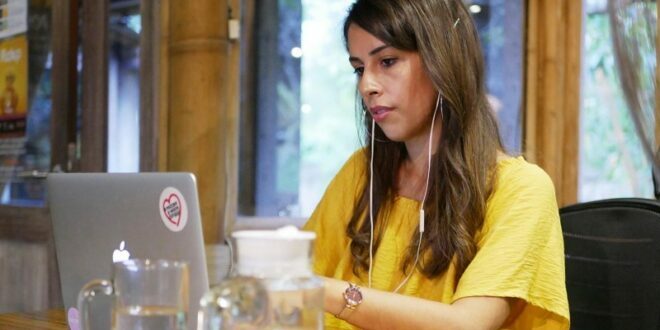 This journalist meets her at Hubud – a coworking space for digital nomads, or so-called ‘location-independent workers’. Hubud is located in Ubud, on the Indonesian island of Bali. Digital nomads are people who work where they want: an emerging phenomenon. You can read more about this topic in other articles by this journalist. A pure digital nomad, however, Sara Maria Hasbun is not. The majority of the year, she works from her home office in Seoul, South Korea. But at least a good third of the time, she takes her work along with her to other countries as she travels. She does this partially because she wants to, but also to meet her colleagues and to learn new languages. “If my family wants to meet me in Japan, I say: ‘Ok, I have a busy week, but I’ll come. Just park me at a café all day,'” she says. As long as there is a good Internet connection, she has no problem working that way, she says. “Every day I have certain expectations I must live up to, and projects that need to be done. But I decide myself when and where they should be done. I love that,” says Sara Maria Hasbun. For Sara Maria Hasbun, this life started in 2013, after she quit her job at a medium-sized translation office in the USA and moved to South Korea with her husband. He is a correspondent for The Wall Street Journal. “I tried to convince my firm that I should work for them remotely. I gave them a whole presentation, and they listened politely, but they were not convinced,” she remembers. Instead, she began to freelance as a translator. She translated from Spanish, French and Russian to English. But in the beginning, she was actually resistant to freelancing. “My motivation to go to Asia was to learn a new language. It was not like I wanted to be a freelancer. I actually missed going to the office, dressing nicely, and I missed having people around me. It was a little scary,” she says. But there was money at stake. In the beginning she had to say yes to freelance projects “under all imaginable conditions,” she explains. Things progressed quickly, though. As she started to receive more and more offers of Korean translation projects, she began to hire small teams of translators, editors, proofreaders, and so on. And to manage it all, she launched Meridian Linguistics, where she now works as a managing director. Fast-forward to 2018. Now Meridian Linguistics has customers such as The Economist, Airbnb and Alibaba – one of the world’s largest online e-commerce stores – and about 2,000 freelance translators around the world. They can handle translations between most languages of the world “anytime,” promises Sara Maria Hasbun. “I think I hit a really exciting time in South Korea’s growth. There has been a really big demand for translations from Korean to English and from English to Korean,” she says. However, she does not manage the whole thing herself. Meridian Linguistics has managers and other key employees in France, New York, England, the Philippines and Japan. In addition, the company’s address is in Hong Kong. Sara Maria Hasbun is not the only one at Meridian Linguistics who has thrown herself into the life of a digital nomad. Many of the freelancers who work for her have done the same. “Maybe one-eighth of them really is on the go, and a quarter of them live in a country that is not their home country,” she estimates. Poor Internet connections, however, are becoming less and less of a problem. “Soon, there will be nowhere left in the world where we can’t work,” as she puts it. However, there are downsides to having a company that is spread out all over the world. “When I first started, I thought: This is so awesome. We can just set up Skype, Slack email, and save a lot of money that way. But there is something invaluable in being in the same place as your team,” Sara Maria Hasbun opines. She misses spontaneous cooperation and deep relationships. But in a paradoxical way, the nomad life comes to her rescue. It is not so difficult to meet someone who is ready to travel most of the time. And Sara Maria Hasbun explains that she prioritizes meeting with, collaborating with, and ‘bouncing ideas’ off the managers and freelancers, wherever the opportunity arises in physical reality. But it is still not the same thing as having an office where everyone sits together. “That is the hardest part. I guess that is why offices exist. You never know when someone will say something that sparks an idea,” she says.